Anyone who is a dog owner will know the struggle of washing a dog during the winter. It's either raining and miserable outside or else it's dry but freezing cold. Either way, you can't send them outside to dry off. And we all know the absolute moment of panic when they leap out of the shower and bound down the stairs while you bellow "DON'T SHAKE!" Alas, it's too late and apart from you looking like a drowned rat and the house smelling like wet dog, the kitchen is now soaking wet to boot. 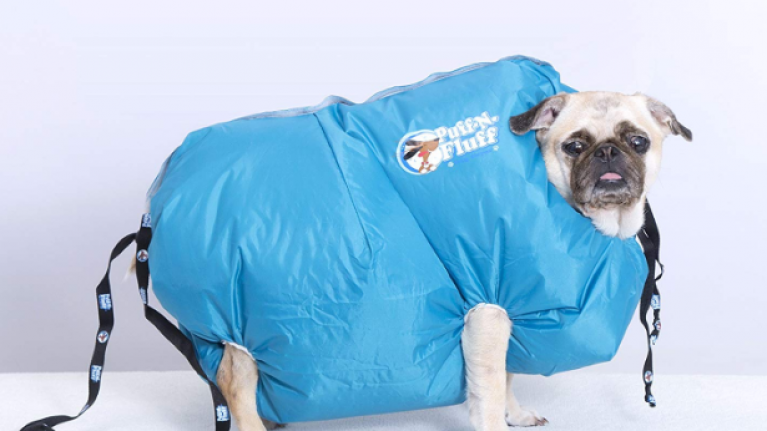 Introducing a revolutionary idea, the Puff-N-Fluff dog dryer which could change your life. It's basically a coat that is available in four different sizes, from extra small to large that you put on your dog when they're wet. You then attach your hairdryer and you should be able to dry your dog quicker and with less distress to the animal if they hate being dried. Prices range from approximately €31 to €57 for the large size. 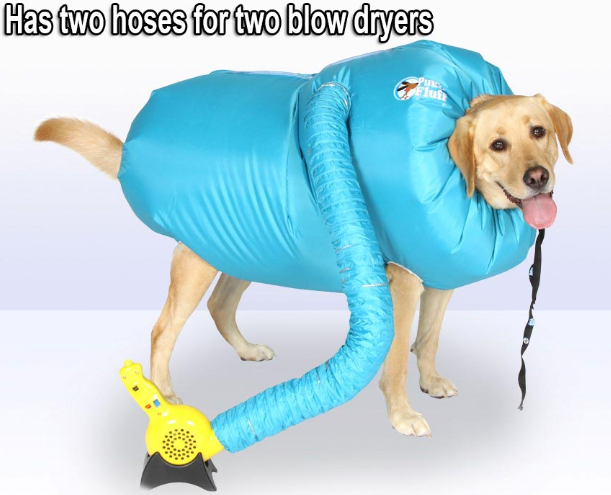 "The Puff-N-Fluff dog dryer is made by using a rectangle piece of material with four elastic leg holes. The paws are placed through the openings, and then the sides are brought together and easily fastened by a hook & loop. Next, pull the draw strings to close the gap around the head and tail. Virtually any blow dryer can be attached to the flex-hose to let warm air circulate around your dog. The hours of waiting for your dog to fully dry is now accomplished within minutes!" What's even better is that the idea was created by a nine-year-old for her 3rd-grade school project and it took off. It's the kind internet we're here for. BRB off to purchase one for every doggo we know.